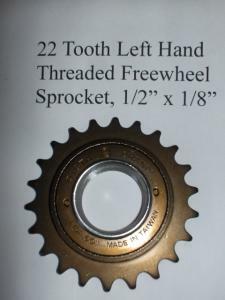 22 Tooth LEFT HAND 1.375 x 24 THREAD Freewheel Sprocket 1/2" x 1/8"
22 Tooth 1.375 x 24 CCW - LEFT HAND THREAD freewheel sprocket. 1/2" pitch x 1/8" width. DICTA Brand, Made In Taiwan. Use 410 or 410H Chain. Good replacement Left hand freewheel for the Electric Power Bikes needing a 22 tooth freewheel. This 22 tooth sprocket will give you 37.5% more low end pulling power then the 16 tooth. It would also reduce your top speed by 37.5% when using the same sprocket on the gear box. Made to fit the Staton Custom hub. Note: We now have LEFT HAND threaded adaptors in the .9" wide with 1.375" x 24 tpi LEFT HAND THREADS. Use the search box or go to the ID size you need to find them.